Each microscope is supplied with a wood storage case having a brass handle. See the excerpt from the 1880 Queen catalog below. 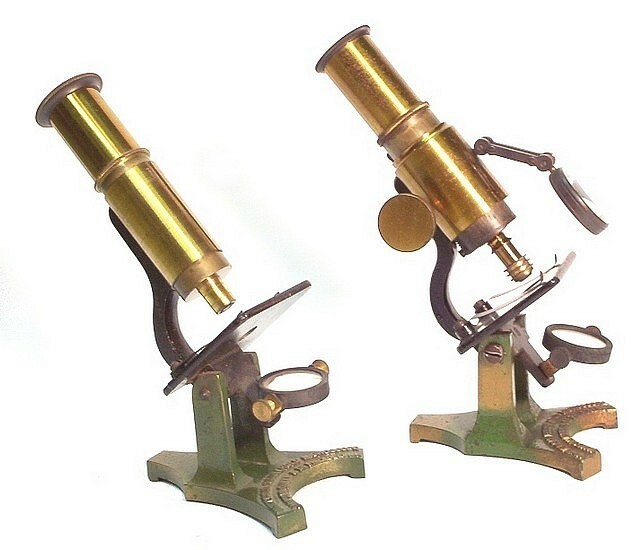 While the microscope on the left corresponds to item 3061 in the catalog, the more advanced example on the right corresponds to item number 3064. The following was extracted from the Price and Illustrated Catalogue of Optical Instruments, James W. Queen & Co., 1889. This admirable instrument is the most complete, convenient, and powerful Microscope ever produced for so low a cost. It has all the important parts of a first-class instrument, is readily adjusted for the examination of all classes of objects, and is well calculated not only to amuse but instruct young persons, and thereby foster a taste for the study of Natural History. The Stand is ten inches in height, with hinged joint, allowing it to be inclined to any angle for convenience of observation. The base is of cast-iron, handsomely bronzed, the compound body of finely lacquered brass, with draw-tube for increasing the power of the object-glasses. These are two in number, and give, in connection with the draw-tube, a range of powers from 20 to 100 diameters, or from 400 to 10,000 times. The stage is of ample size, and is provided with spring clips for holding the object whilst under observation; beneath is a concave mirror, conveniently jointed, for the illumination of all transparent objects. All the ordinary animalculæ found in pond-water can be satisfactorily shown with this Microscope. One prepared object, two glass slips, and a pair of brass forceps, are furnished with it, and the whole is packed in a neat and strong walnut wood case. 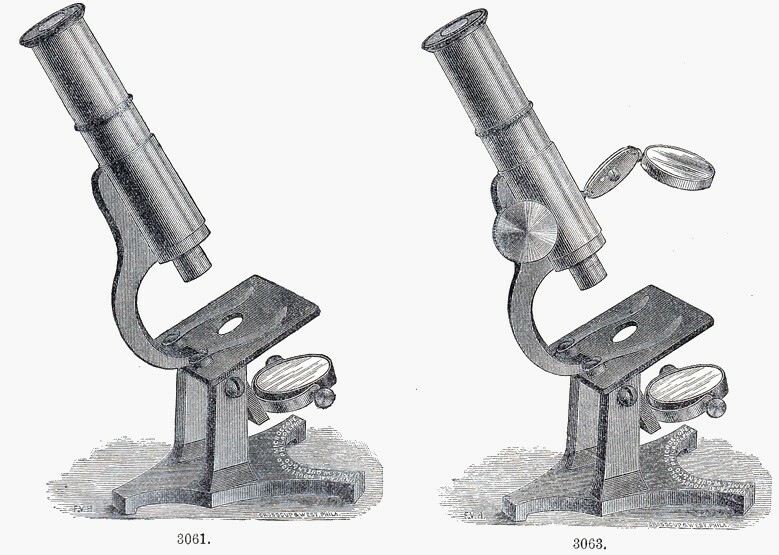 We believe these Microscopes — from 3061 to 3064 — cover the entire field possible for such cheap instruments, and that in all essentials they are far in advance of anything heretofore offered the public. In the ten years that have elapsed since we first introduced No. 3061, we have sold several thousands of the same, and always with satisfaction to the purchasers.